A diagnostic medical sonographer is another name for an ultrasound technician. Most often, people think that an ultrasound technician’s job is to take images of unborn babies that are still in utero. This is certainly one of the main responsibilities for most human-based ultrasound laboratories. What many people don’t commonly know is that a person interested in ultrasonography can take a different path. They can become an ultrasound technician for animals. Before expanding on this job’s responsibilities it makes sense overall to clarify exactly what the ultrasound technician really does for a living. Specifically, the job of an ultrasound technician is to use equipment used for imaging. This equipment records internal pictures of a body. A doctor (or in this case a veterinarian) will interpret these pictures and the results will be used for correct diagnosis and treatment of the patient. An ultrasound technician may work in a clinic, medical lab, or hospital. If they are working on animals, they may work in a veterinary office, a university, or for a large animal care provider. (think horses or cattle) As advancements are made in medical science, ultrasound technology is becoming more and more relevant and important. 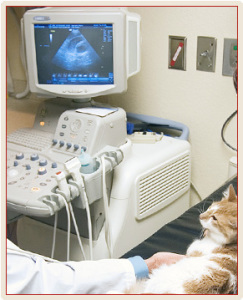 Ultrasound technology…specifically for animals is also growing as a unique offshoot of medical services. Experts in the ultrasound field must be extensively trained to do their jobs well. Training takes at least two years to complete, but may end up being four years in some instances. Usually those who work with animal ultrasongraphy have attended a 4 year university and have specialized in veterinary medicine or agricultural or environmental sciences. Generally speaking most technicians who specialize in animal ultraounds make a good living and enjoy relatively decent working hour. The exception would be if an animal gets hurt or sick and a “house call” is made during the night. Obviously this is an unexpected event and is difficult to base an entire career on this one situation. As mentioned earlier, the veterinary medical field is expanding. This is why there is a great need for services that an ultrasound technician for animals provides in larger animal hospitals. A veterinary hospital that deals directly with pets such as dogs and cats is especially looking for the right applicant. An animal owner values their pets and want them to get the best service that is possible. This includes the area of ultrasound scanning. It has been said that an ultrasound tech has a very important job. Obviously, animals can’t tell their symptoms to a vet. Because of this, its even more important to try to discover what is ailing the animal by exploring their bodies with non-invasive tools like ultraousnd. By obtaining images of their internal organs, the ultrasound techs can help the doctor or vet make a good diagnosis ensuring that the animal will get the proper treatment. If you are considering entering this field, make sure to do more research on colleges or universities that will allow you to get hands on work with the actual equipment. Having this advantage, greatly helps you when searching for a job after graduation.